Arlington is a city of 18,000 that is proud of its “hometown feel”. Located in northern Snohomish County, Arlington is several miles inland of Port Susan, between the Puget Sound and Skagit Bay, in Washington state. It is roughly in the center between Seattle, Washington, and Vancouver, British Columbia. 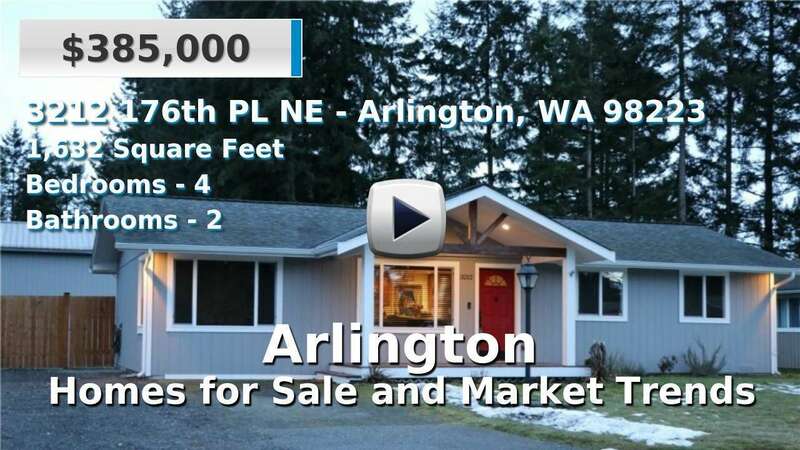 Homes for sale in Arlington are generally newer or custom built and tend to sit on acreage, if not in one of the many established neighborhoods. This area is mostly rural, though the city boasts it has everything a resident may need from stores to parks and trails. People here enjoy riverfront recreation on the Stillaguamish River and are a ferry ride away from Camano and Whidbey Islands. 3 Beds | 2 Baths | 2163 sq. Ft.
2 Beds | 2 Baths | 1426 sq. Ft.
4 Beds | 2 Baths | 1660 sq. Ft.
3 Beds | 1.5 Baths | 1342 sq. Ft.
4 Beds | 2.25 Baths | 2603 sq. Ft.
3 Beds | 1.5 Baths | 1088 sq. Ft.